A few posts back I mentioned that I was, seriously this year, going to get rid of my stash. 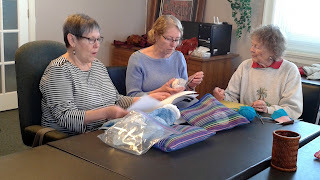 The method planned was to knit head, neck and shoulder pieces to give away next Christmas. 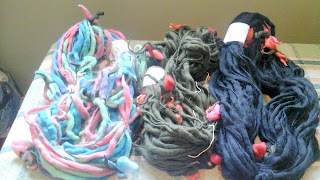 Using great quantities of stash yarn for each piece was the goal. 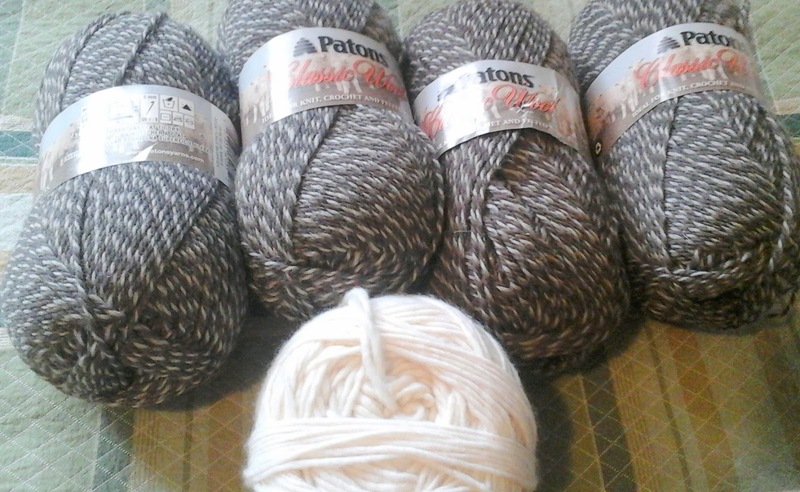 In fact I do believe I used the word annihilation in describing the 2016 goal for my stash. Well, Bag Lady Sue changed my modus operendi. As of yesterday I have given up on the annihilation and have started to move forward to the enhancement. Stash enhancement. Yep a complete 180. 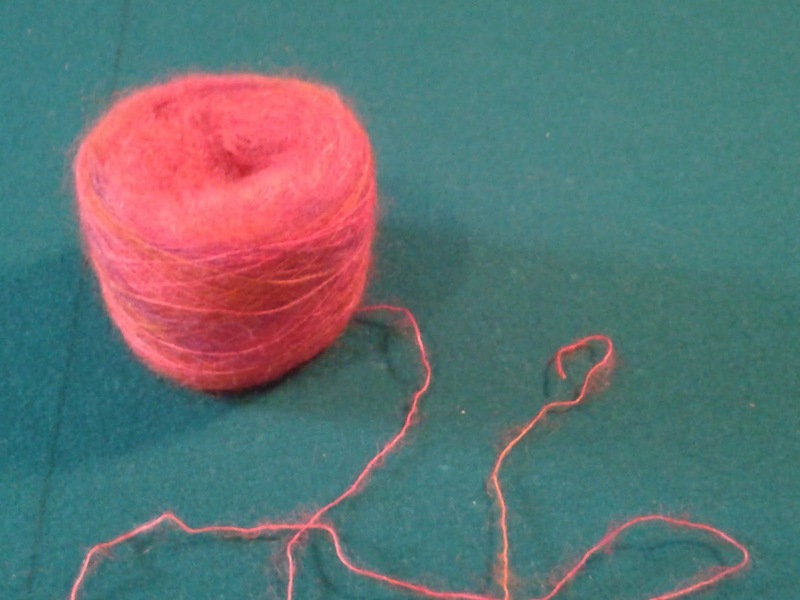 There is just no explaining the way a knitter's mind works. Here is what I brought home from Sue's great give-away. This glorious roving type yarn with globs of contrast colour attached will make wonderful cowls. Just a simple cast on of 30 - 50 stitches, a BIG needle and knit until the 50 yards in each skein is gone. 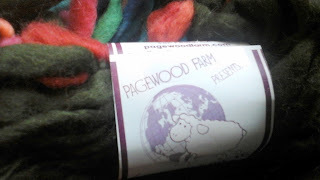 The yarn by Pagewood Farms comes from Arizona. Designer yarn for sure. 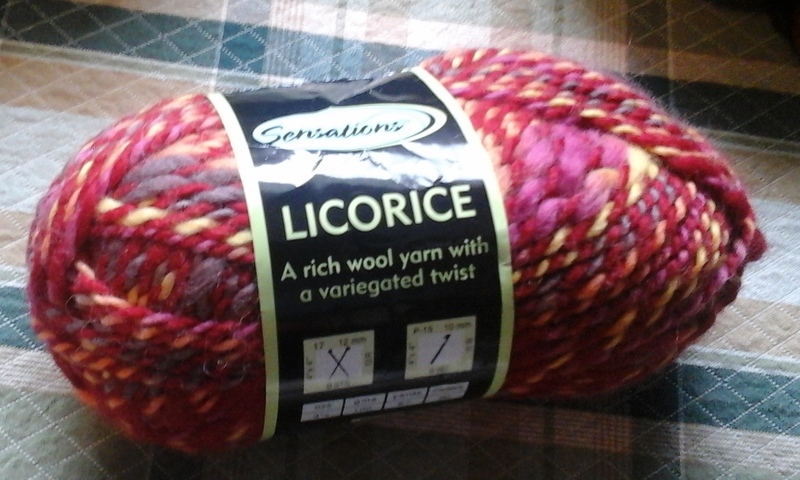 A ball of red licorice for another cowl Such colours. 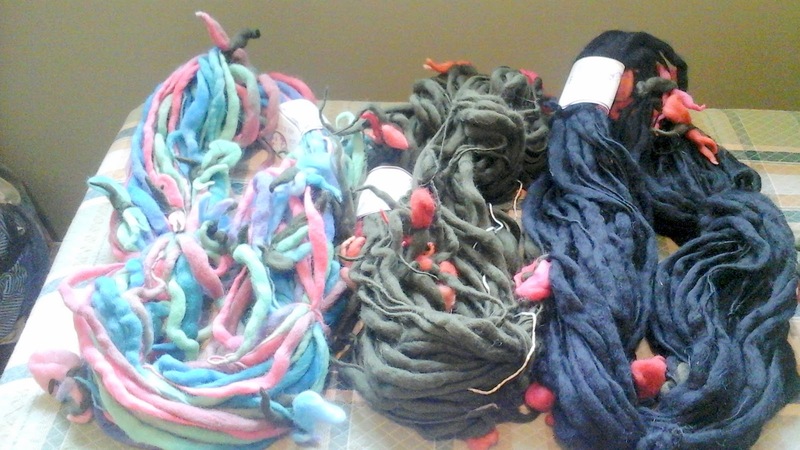 More roving type yarn in bright colours. More cowls. 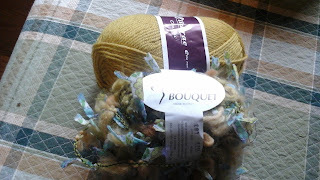 And last, forced on me by Sharon R, who knows my colour palette, is this gorgeous ball of Trend Setter Bouquet in various shades of greens and blues and various textures of ribbons and yarn along with a coordinating ball of Ella Rae. The green in these yarns is a pukie, pea-soup green. Should look wonderful on me. I'm thinking cowl again. No, NO! Someone stop me. 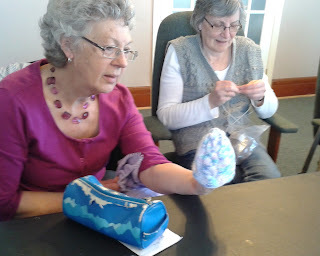 We had a knitterly, better-than-Christmas afternoon, today at knit group. Better than Santa or Pere Noel. Better than a stuffed stocking hanging from the mantel. What we had today was a visit from Sandy's Sister Sue. 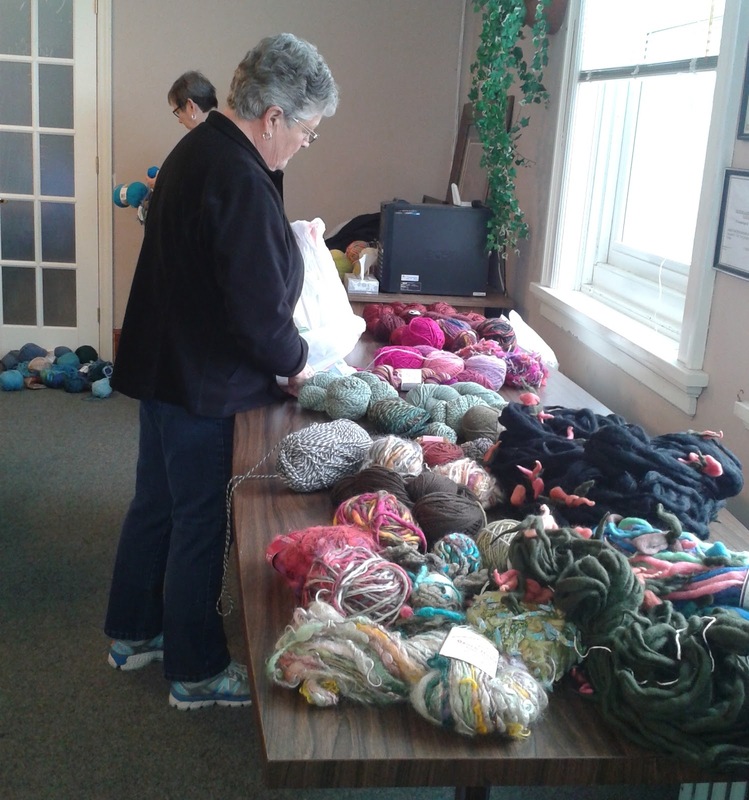 Better known, because of her beautiful, hand-knit, felted bags, as Bag Lady Sue. 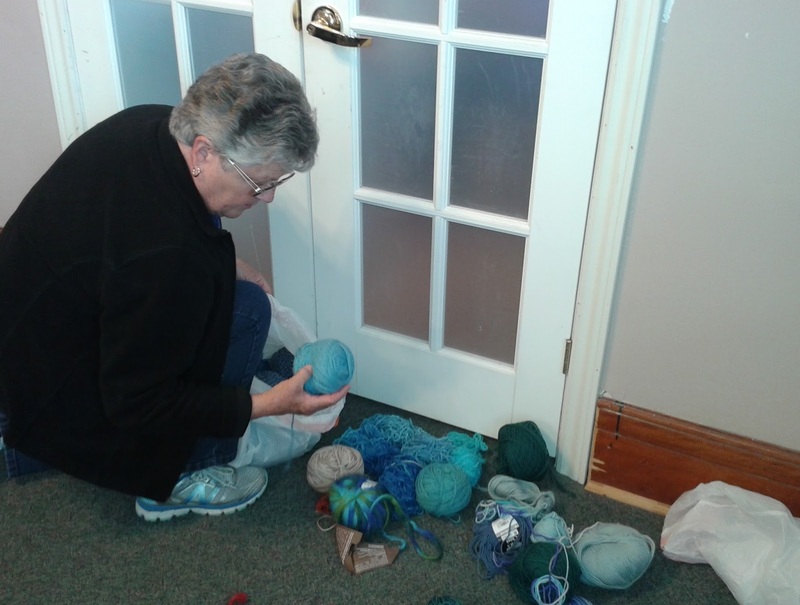 We love it when Sue visits Sandy because she brings us all her no-longer-wanted yarn. Shopping at Sue's is about the best yarn shopping one could do. 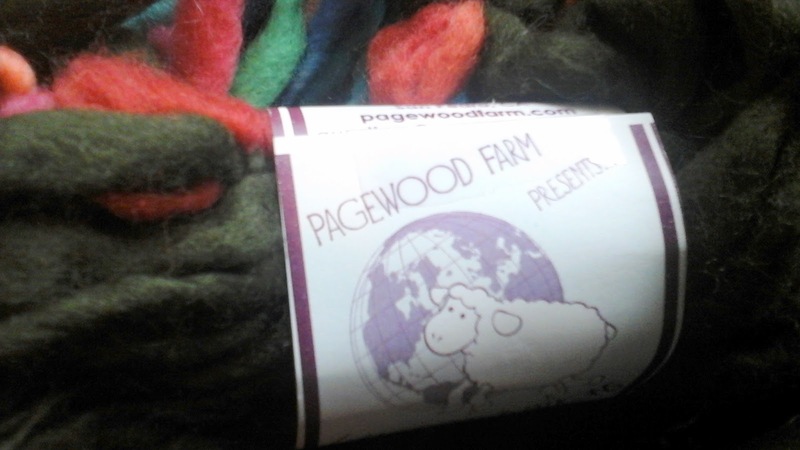 Quality yarns, unusual yarns, designer yarns, sourced from near and far. Like shopping online but with the tactile experience included. Mind you, despite our yarn haul, none of us were/are as lucky as Sandy. Look at the shawl she is wearing. Sue's design, knit by Sue. 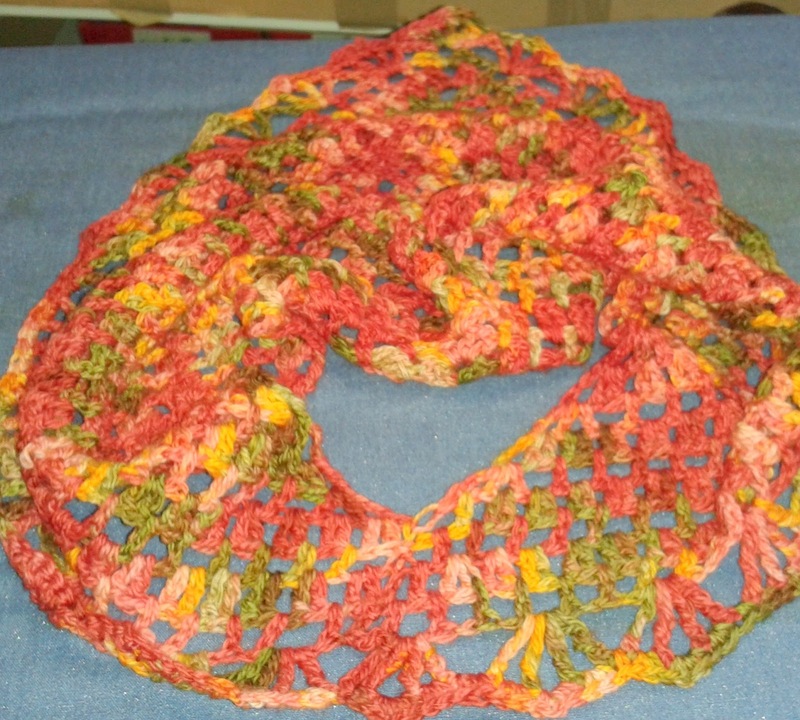 Sue's Poppy Shawl, gifted to Sandy. 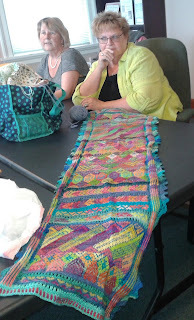 Sue brought with her, another gorgeous shawl. Such creativity. Such a way with colour. Such a way with design. Sue is truly a one-of-a kind knitter. We are privileged to know her and darn lucky to be the beneficiaries of her cast-offs. THANK YOU SUE. There has been some daytime knitting. It's a hard thing to do, daytime knitting. 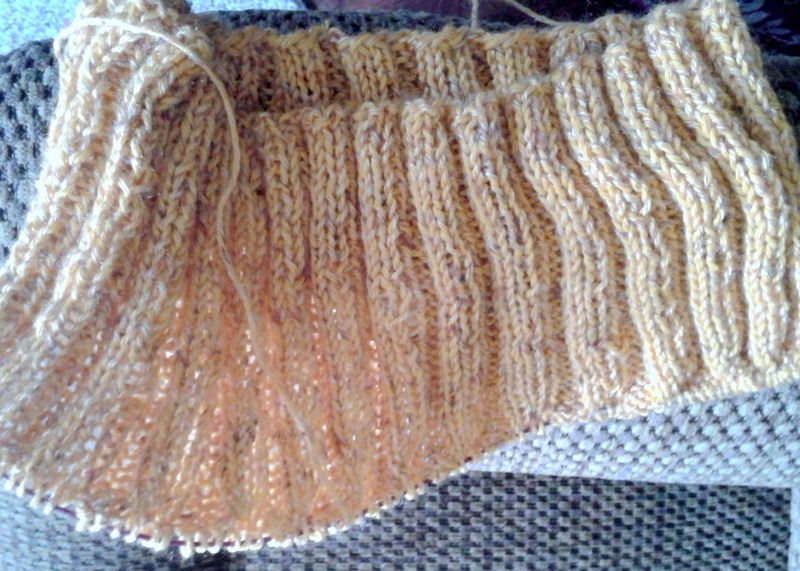 Too many years of a 9-5 work habit have made me suspicious of my own intentions when I sit down, mid-afternoon, to knit. But with Black Margarita, and my age-related, less-than-perfect vision, I have no choice. 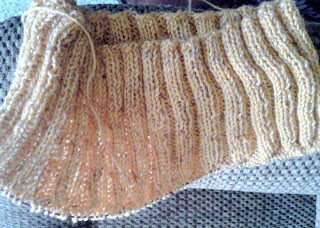 Despite the lack of knitting hours and depsite the rip-backs due to much too interesting telelvision, I have, nonetheless, just passed the 'great divide' of sleeves from body. Today, I will bring out my bravery and try it on. 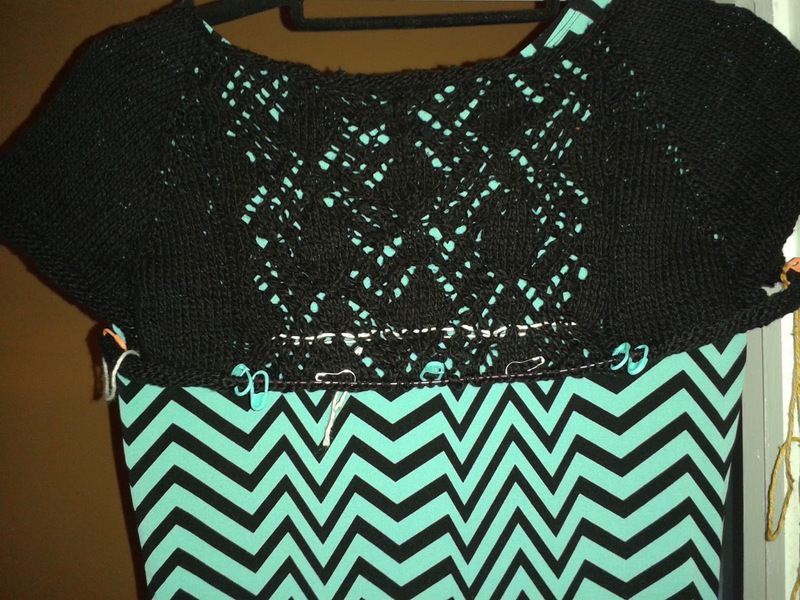 Without me in it, I did place it over the shoulders of one of the dresses that inspired the knit. I love, love, love it, so I hope, hope hope it fits. There are, I'm sure, mistakes in the lace. But I'm also sure that with all that is going on in the pattern, the mistakes will go un-noticed. If not, I subscribe to the philosophy that "Those that matter won't mind and those that mind don't matter." Each year, my ladies group at Church, draws names to select a secret pal for the year. We learn their birthday, anniversary, favourite colour and favourite season. Throughout the year, we send cards and little gifts to encourage and remember our secret pal. 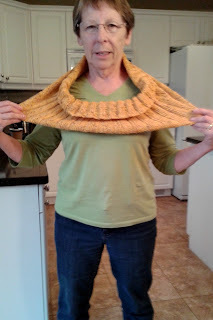 Look what I've knit for my yellow-loving, secret pal. What the heck is it you might ask when you see it laid flat on my bed. 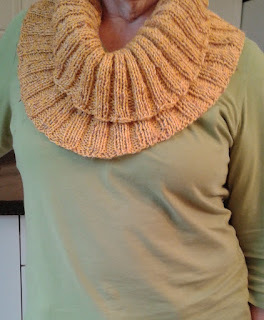 But around my neck, in 3D fashion, you can see it is a fun cowl. 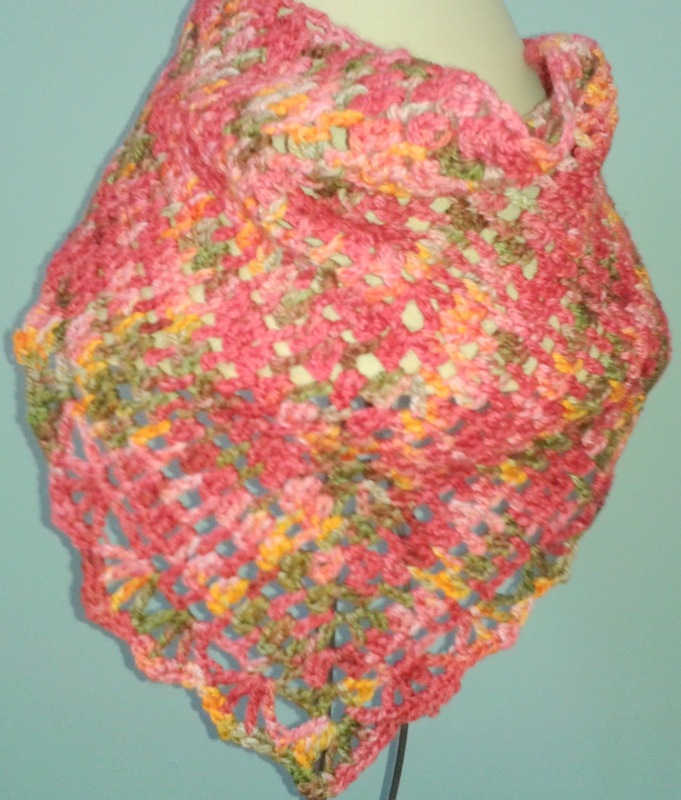 The pattern, the 3 Rib Cowl by Debbie Seton is a free ravelry pattern. Easy to knit, it is a great mindless project. The finished results belie the easiness and that is always a good thing. I love the way it drapes in such fun fashion. I've pulled it in varous directions to show you how stretchy it is. 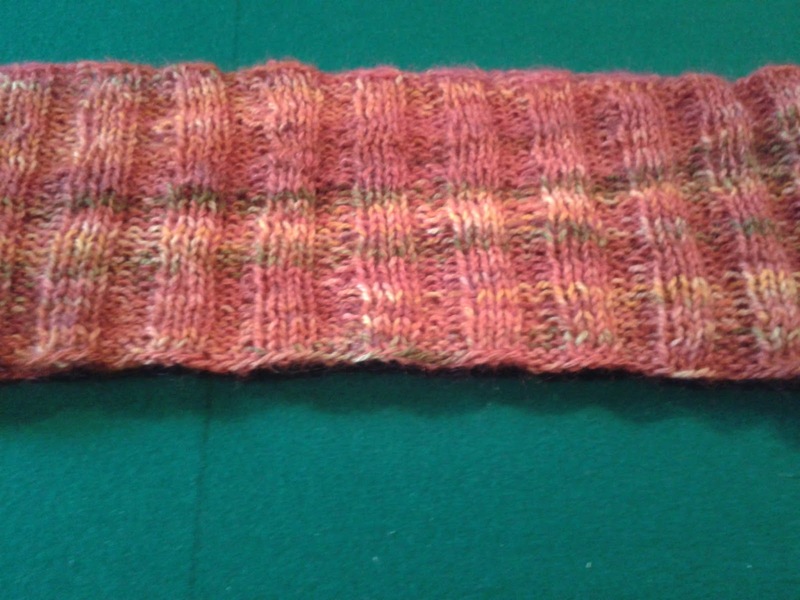 Instead of the Aran weight yarn called for in the pattern, I used DK, Cabin Fever Cotton Tweed with a 5.5mm needle. 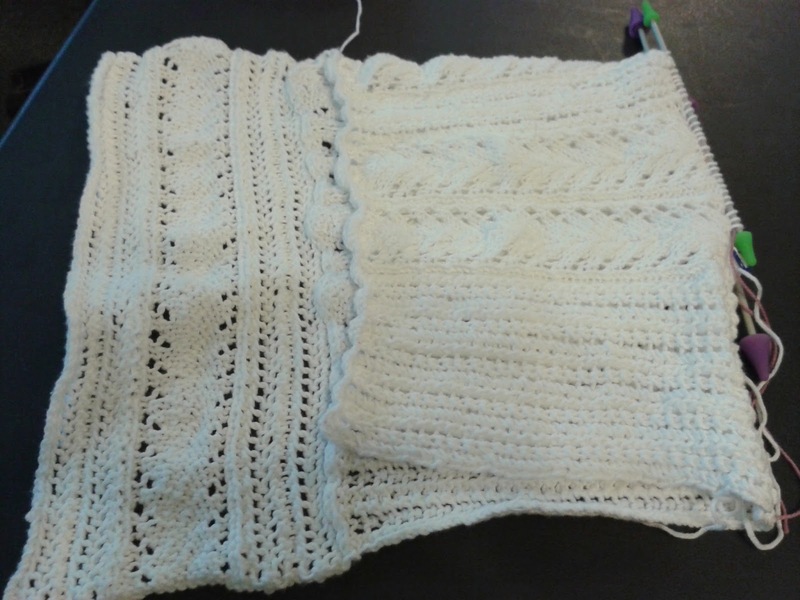 With my smaller gauge yarn, I guessed at an appropriate number of stitches to cast on that would give me the same length/look as the pattern. My memory is failing me but I believe I cast on about 166 sts. I like the look. This one will wait to be delivered until we exchange Christmas gifts. If I were to give it to my yellow-loving, 'secret pal' now, my identity would be secret no longer. I have a reputatuion as 'the knitter' in the group. Was 50 Shades Of Grey a book about the weather? Could well have been a description of the colour of the skies this spring. The only bright spot in our day was in the room at knit group. 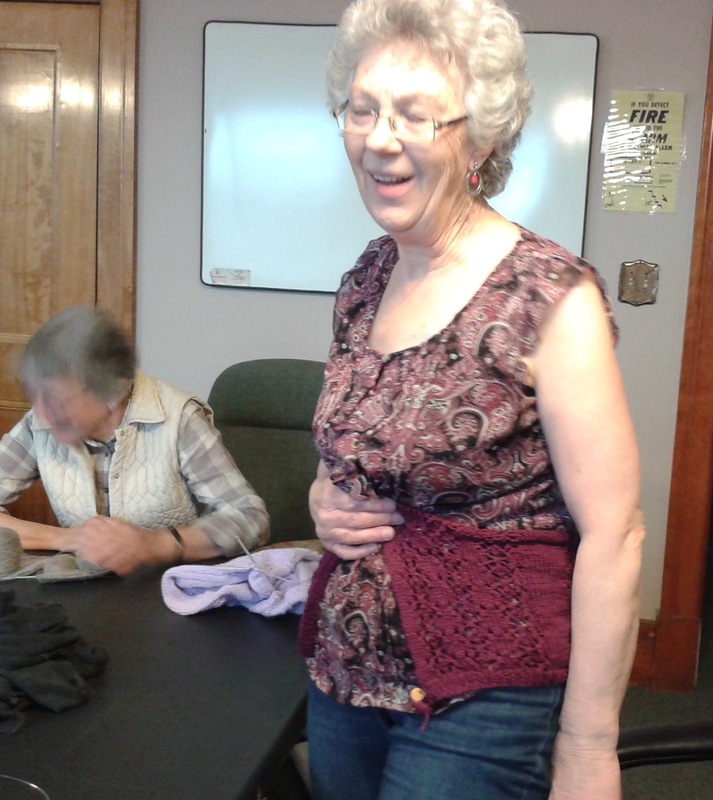 Sharon R is working on her Cinnie. Apparently, my green one inspired her to knit one for herself. 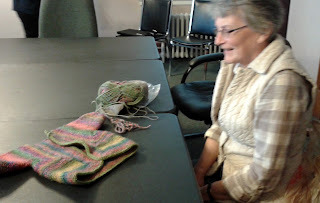 She said she is quite proud of herself that she can knit well enough to make a Cinnie. Indeed she should be proud of herself - it is looking gorgeous. Here you see the back panel and the left side of the front and back. She is about to start the sleeve. Below you see Sharon's attempt to hide from the camera. 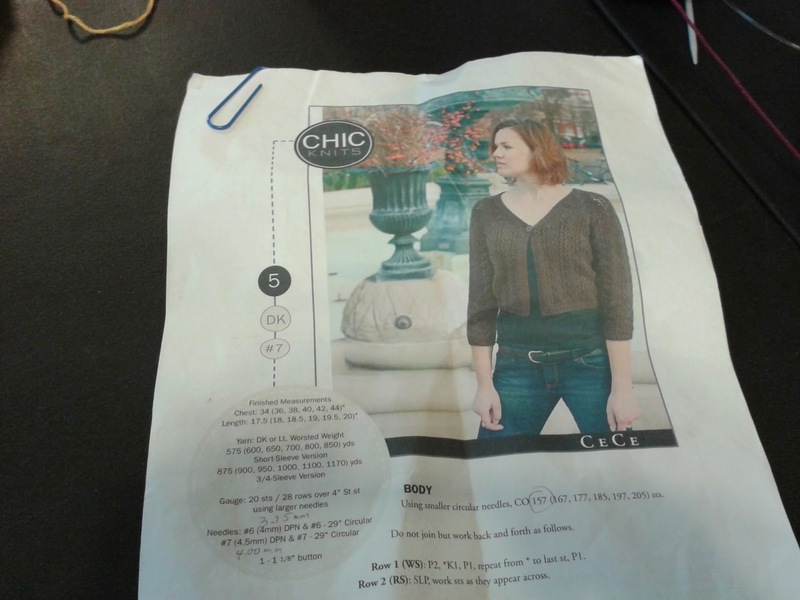 Cinnie is a Chic Knits pattern designed by Bonne Marie Burns. Popular designer at knit group today, as Wilma was working on one too. Her pattern is CeCe. This one, she said she started in Pima Cotton about two years ago then set it aside. But she thinks it is too small. Yep, sure looks like it Wilma. 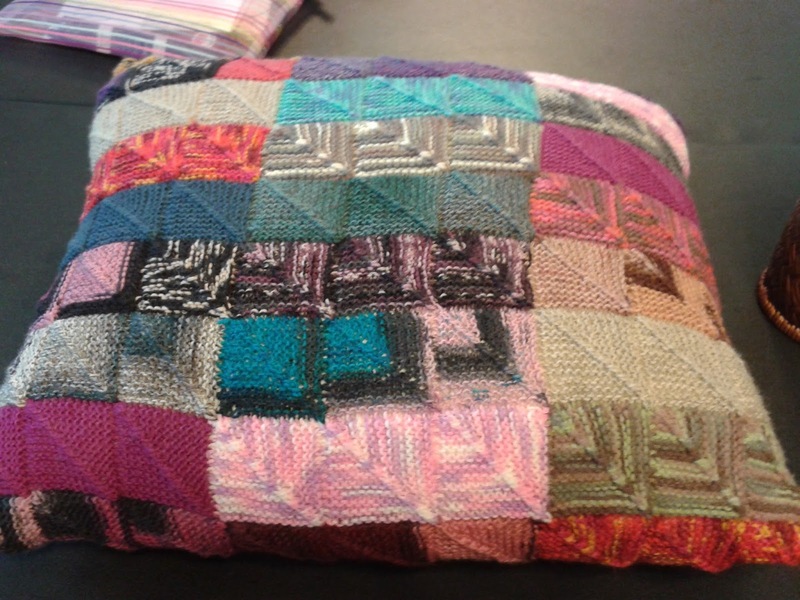 Bonnie brought her finished, Mitered Square pillow for show and tell. 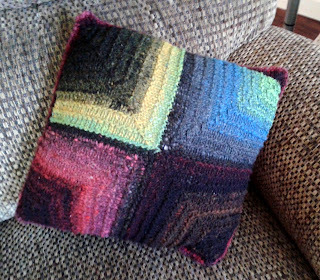 The three taupe squares in the bottom right part of the pillow are close to the colour of her furniture, she said. Throwing the pillow on the sofa, she thought "Wow! That looks good!" Always nice to have a successful finish to a project. Joanne was back in town today and came to knit with us. 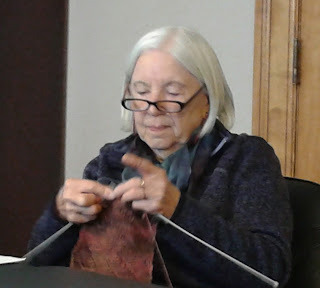 She has moved to Toronto to be closer to family but misses her knitting friends, small town living and Georgian Bay. From time to time, she drives up to spend time at her house on the water and when here, stops in to see us. Babies are big on everyone's mind these days. Sandy's grand son is expected to arrive in this world Monday and Carol has been knitting a sweater for him. 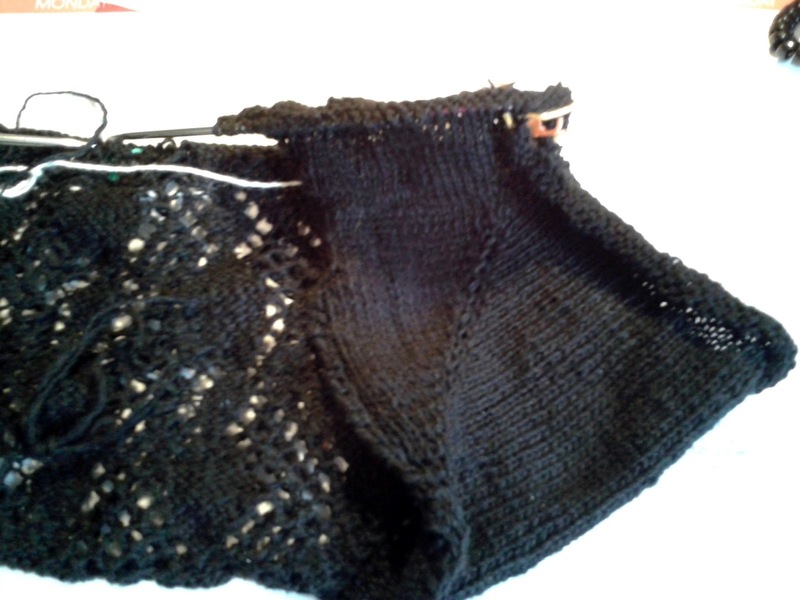 Better seen in the close-up below, it is a hooded cardi. Cute and just in time. Jean, too, is expecting a grand child but doesn't yet know if it is a boy or a girl. She picked bright, cheerful, gender-neutral colours for this Baby Surprise Jacket. The yarn is Chamelon from Michael's. What a great choice for a baby project. 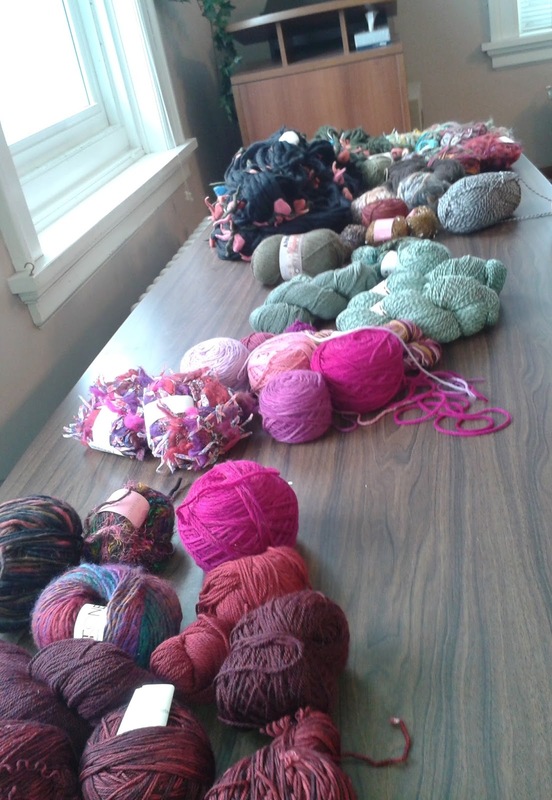 The day might have been grey, but definitely not dreary at knit group, with all the bright colours round the table today. Two Rabbit Holes In One Week? This might be a bit much. Already deep down a dark hole with my Margarita sweater, I am now about to tumble down another hole. The Mitered Square Hole. decide it would be fun to work together on a project. Same project for all. Same time frame for all. A small-group KAL. Unlike our normal routine where they bring their own projects to class, work at their own pace and seek help from me for any issues they encounter in their individual projects, today we start one of the group projects. This time they have selected Mitered Squares. 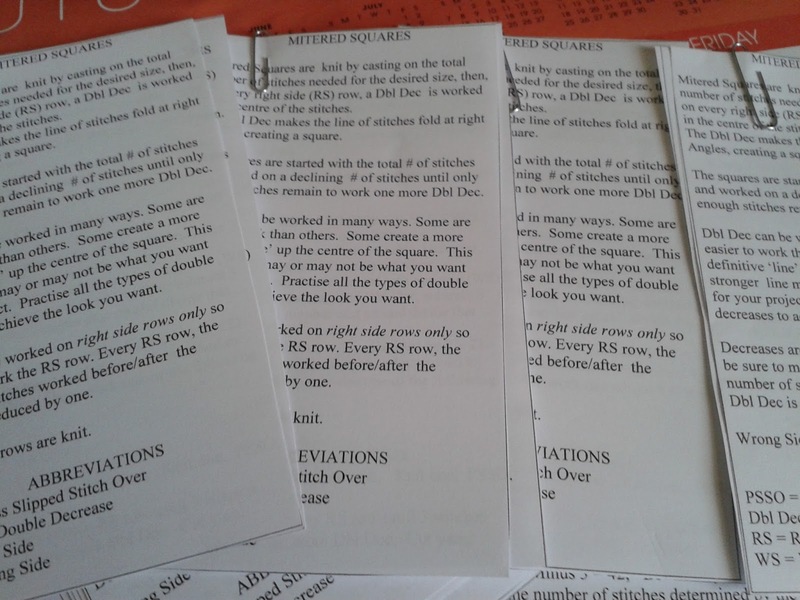 This past week, I have been getting ready to help them learn how to do a mitered square. For me, the ex-teacher, that means dissecting the process to death. Dissecting the process until I learn how to take it apart, see it from beginning to end; see it from easy to complicated; see it from overview to specifics, see where it means to take me and how I should best get there. I take out all the big words, make sure I begin at the beginning and make sure I walk step by step through the dark unknown to the well-lit 'Ahaa! moment. 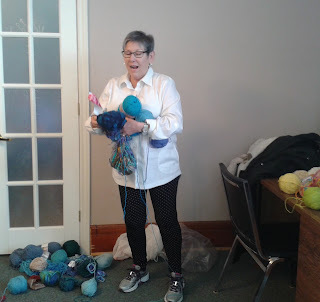 That I hope, will lead all knitters to the finish line, happy and frustration free. and my one and only mitered square project to use as an example. Some want only to learn the technique while others want to learn the technique then apply it to a pattern. 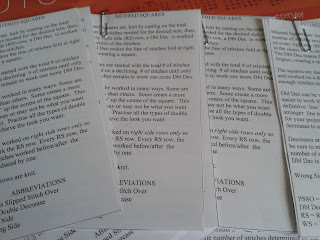 A successful lesson should soon give me some Mitered Square project pictures to show you. I have fallen down a rabbit hole. One that is very black. One that requires much patience on my part. One that makes me take one step forward, two steps backwards. I am knitting a black sweater - Margarita by Baby Cocktails. The sweater, being black, is challenging enough but even more so when you consider that the entire sweater back is worked in lace. Black lace. Sober, the knitting of lace in the colour black is daunting enough, I wouldn't want to try it with a few cocktails in me - baby ones or not. 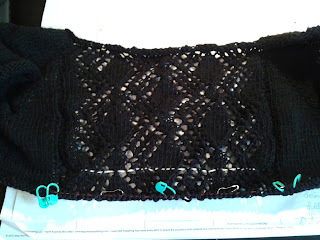 The combo of lace in black makes it a daytime knit for me. 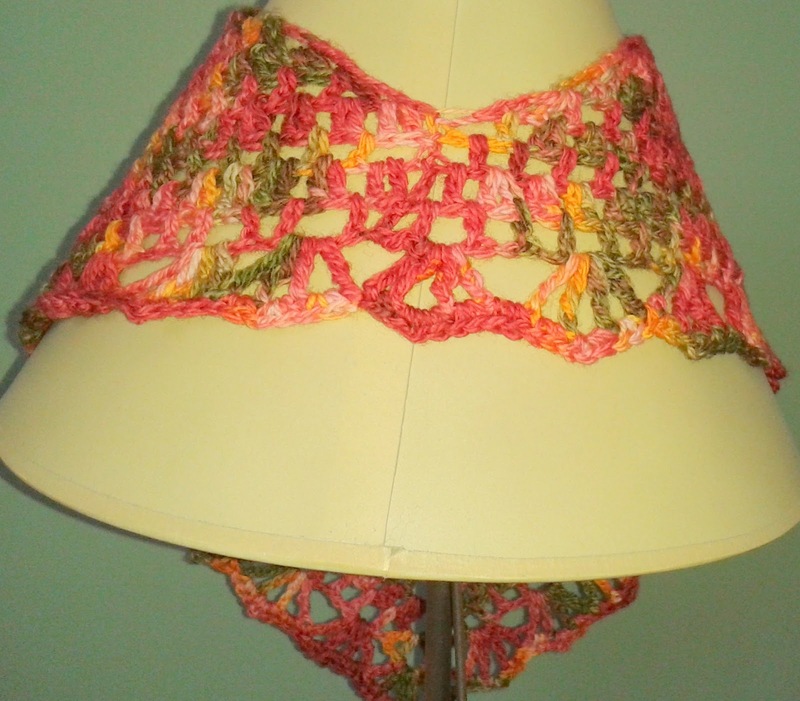 A daytime knit sitting in front of a south facing window. No problem. 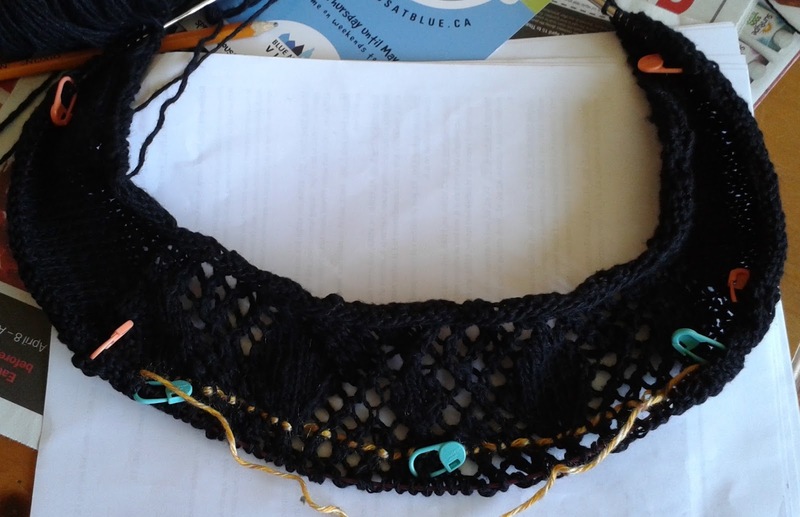 I can watch my latest Netflix episodic drama, Broadchurch, while I knit. No I can't. If I watch Broadchurch and knit, I make too many mistakes and have to rip back. See my lifeline? It has been used more than once. My Margarita might force me to drink. Nothing small and babyish either. A sunny, mild Thursday! What a change and what a great day for kitting. Babies were on every one's mind this week. Wilma has knit a teeny, tiny baby hat, with cables no less. It is going out west to her daughter. No, no, no new Grand kids. The daughter is a teacher and each spring break her school sends a class to Nicaragua on a mission trip. They help out at an orphanage and the babies there need hats and blankets. Wilma will have one of each for the class to take. Sharon and her Mother-in-Law, in town for the big quilt show this weekend, are in awe of the little baby set that Sharon R knit. It is a Cabin Fever pattern. 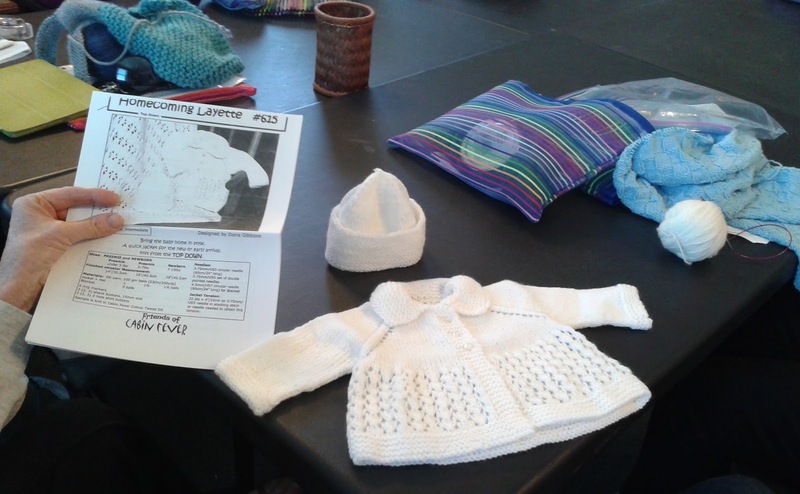 Top down, cute as can be and next on Sharon's list of 'knits for the baby'. 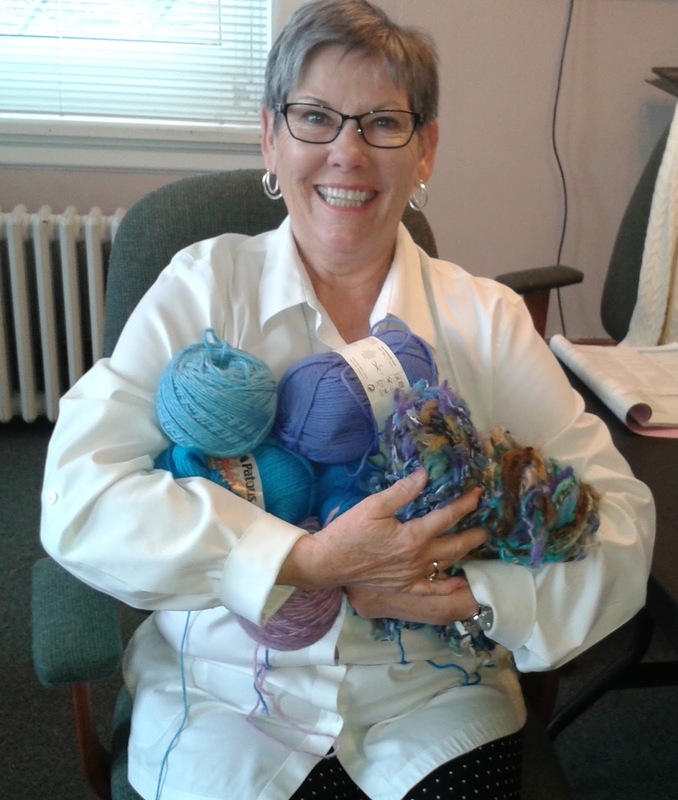 Sandy has been knitting what she calls Lovies. Meaning, a baby's favourite, soft and cuddly thing to love. 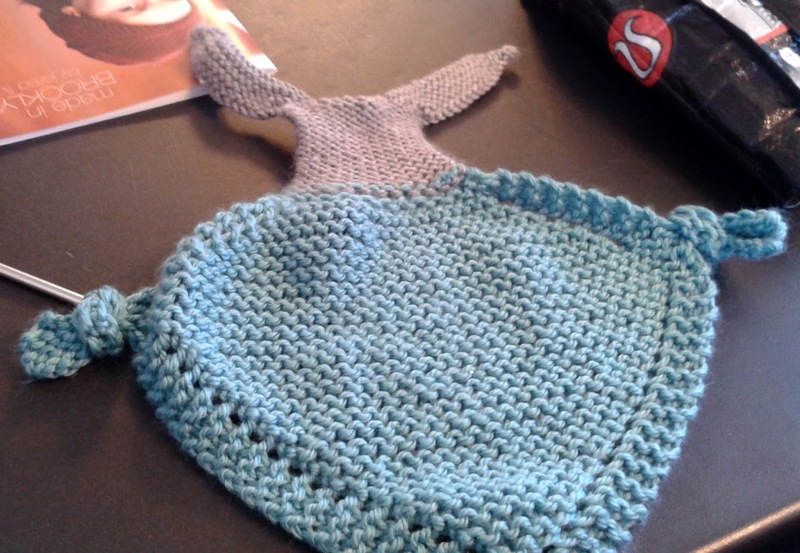 Knit with chunky yarn, there are side handles - perhaps those are love handles - as well as ears for the baby to grab onto. The head will get stuffed and eyes sewn on. A cute baby toy for Sandy's soon to be born grandchild. A quick and easy evening knit that I can just picture the baby lovingly dragging everywhere for years. In spring, we know what a yong man's thoughts turn to. 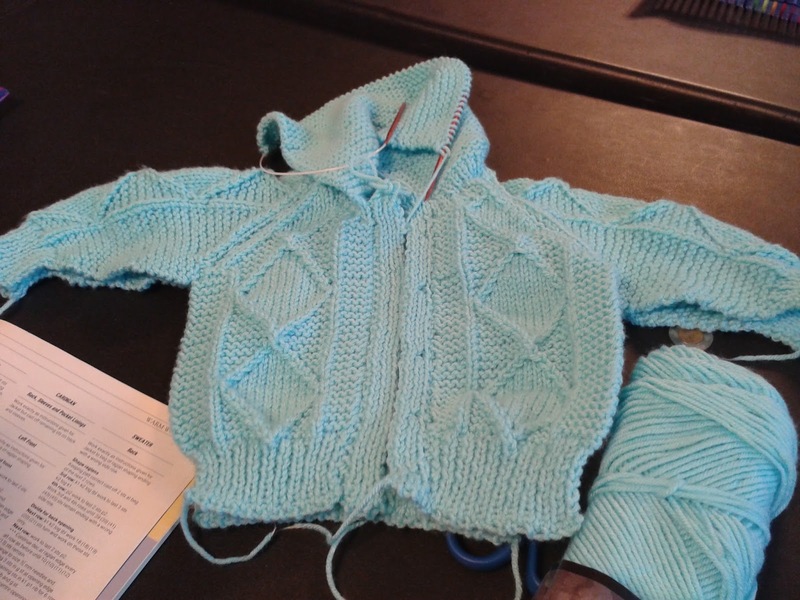 A knitters thoughts, it appears, turn to baby knitting. Stash reduction and road trips are a great combo. 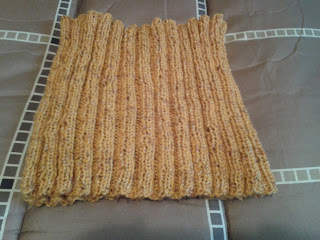 While travelling to and from Toronto on the weekend, I started this cowl. This is a gift for a friend whose favourite colour is yellow. 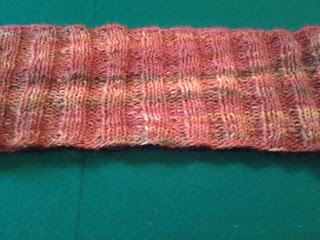 Mine is being knit with Cabin Fever Cotton Tweed that found its way into my stash sometime over the last few years. 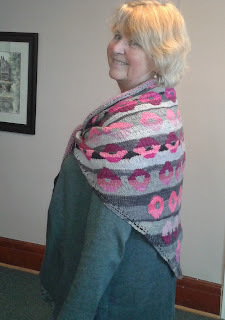 The pattern is 3 Rib Cowl by Debbie Seton. Free on ravelry. 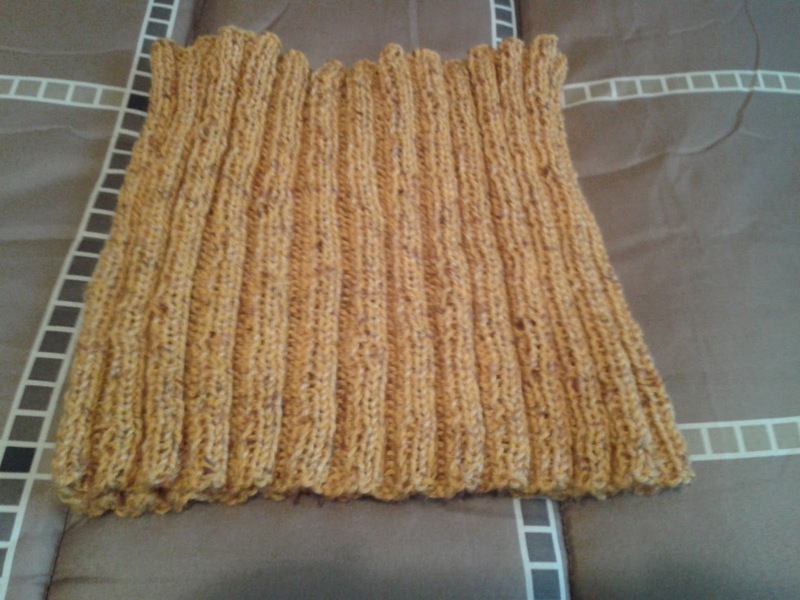 A simple 3x3 rib that you knit for 11 inches. 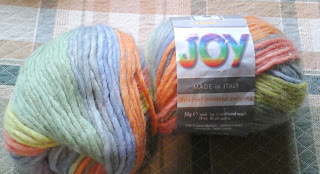 Or, until you run out of yarn, as I did with the one below. Closer to six inches than eleven it still makes a great neck warmer. and held together with a very fine mohair. The mohair, also from stash and also so old that details of its particulars are long forgotten, bulked up the stitches enough to make a very cozy, cold-weather-defying piece. 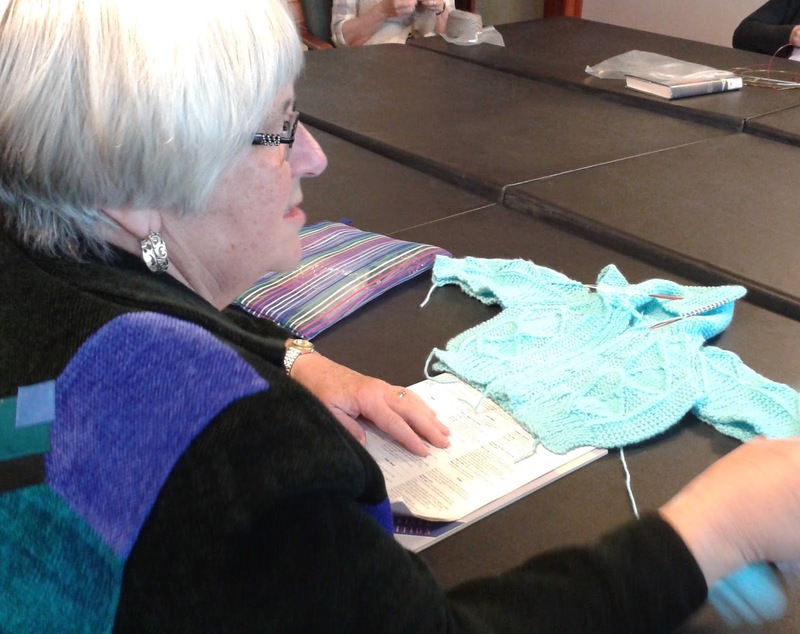 These fast, addictive knits, can be finished in a weekend. Great gifts and great stash busters. My intentions exactly. It started with the Blue Jays. I have always wanted to go to the home opener - the first game of the season played on home turf. 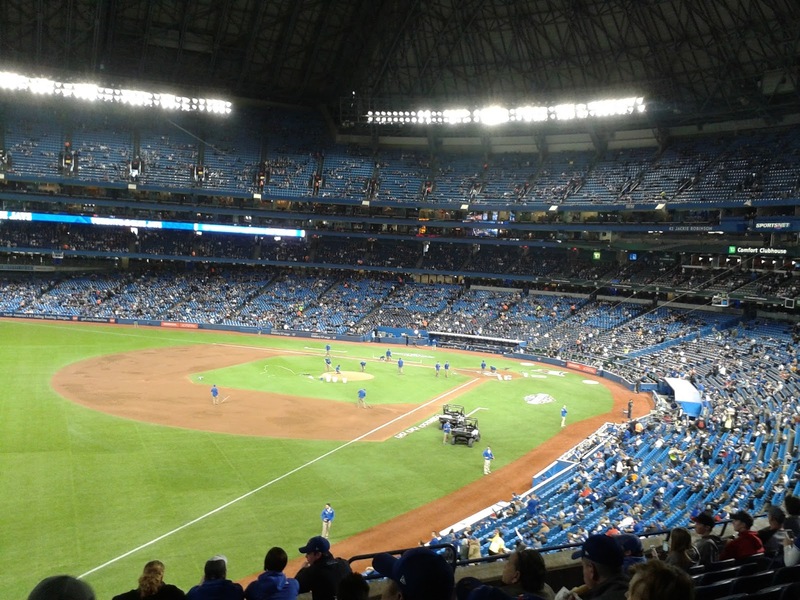 Having purchased enough Jays tickets to now be on their 'special' email list, I received notice in late January, while in Florida, that I could buy home opener tickets before the ticket booth opened to the crowds. BUT - dang if they didn't hike the price of those tickets. Tripled the cost for the home opener. I settled for home opening weekend and bought regularly-priced tickets to Sunday's game. 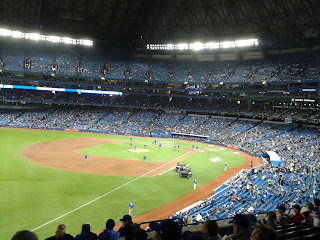 In the end, it turned out for the best as that was the only game all weekend that the Jays won. Son Peter and his lovely 'Lady of Spain' hosted us in a role-reversal weekend. When Peter was young and came home for the weekend, Mom and Dad operated the 'hotel' while son came and went, popping in from time to time to sleep and eat. This weekend, it was the reverse. Fred and I popped in and out, Peter cooked and hosted. Pay back! 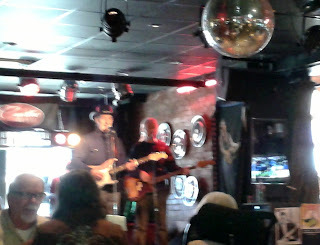 Saturday, we saw my favourite Toronto, Saturday-afternoon, music guy. 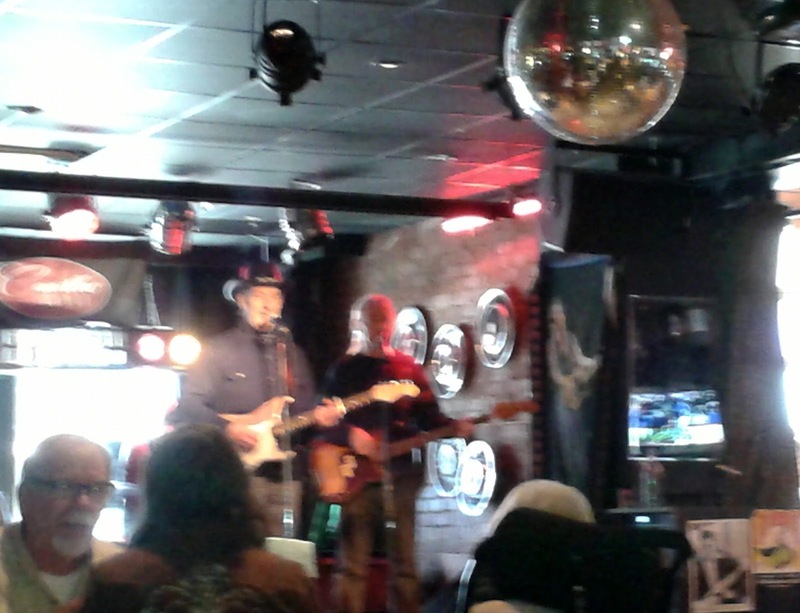 From Peter's place, we can walk to see Danny Marks, now playing Saturday afternoons at the Cadillac Lounge on Queen St West. 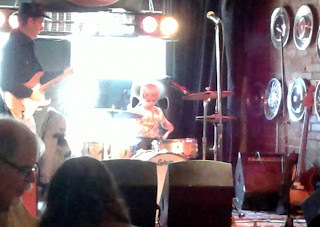 A few young families were in the crowd this past Saturday. Danny treats the kids well and even had this little guy up playing the drums. and feast on fat, hot dogs, fries, nachos and licorice. Can't beat that! 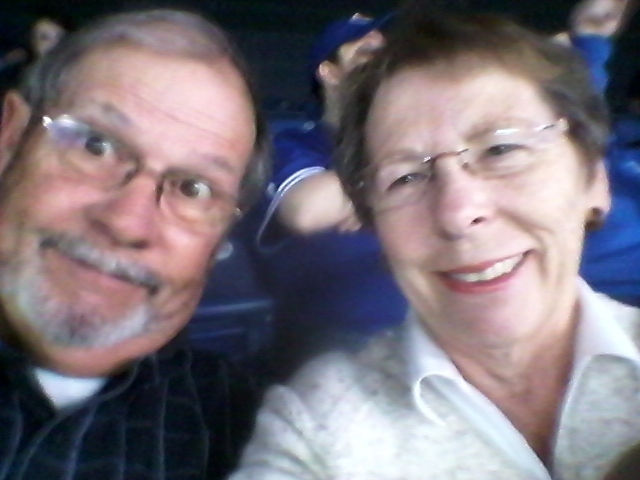 And the Jays won! Great fun. There was car knitting, both coming and going. I'll tell you all about that tomorrow. I Don't Like To Crochet. 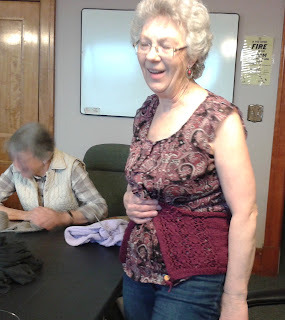 Wilma, a couple of weeks ago at knit group, was showing off her lovely, cotton, crocheted kerchief. 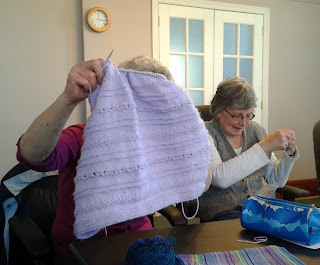 The pattern, on line, is the knitted Zuzu's Petals, but one of the staff at the Alberta LYS where Wilma was shopping while visiting her daughter, had converted the pattern to crochet. 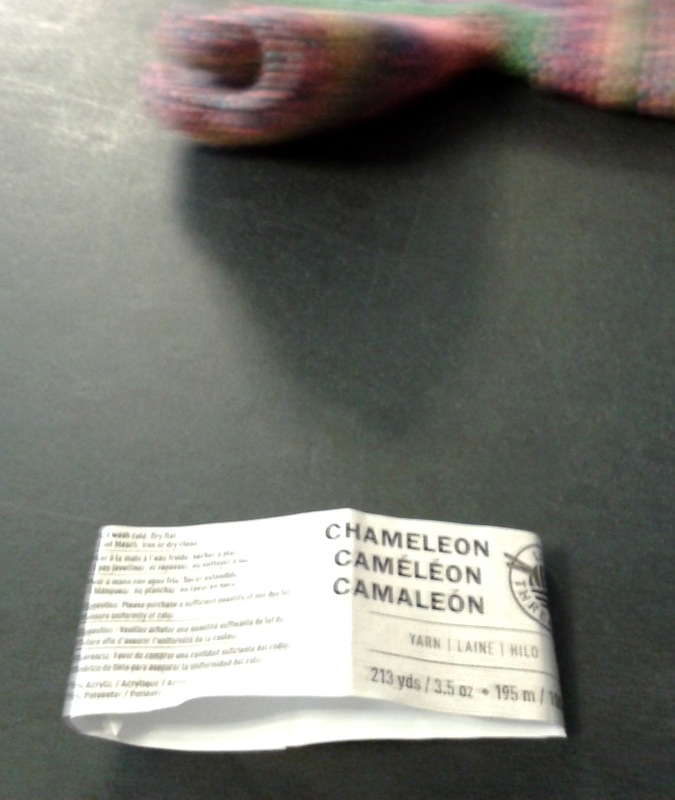 Kindly, Wilma shared the pattern with me. Wilma crochets often. She enjoys it and is very good at it. Me? 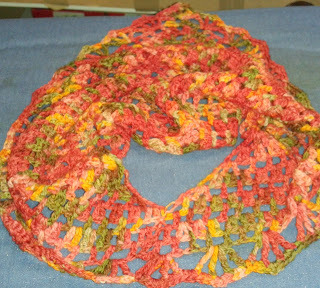 I can crochet. In fact I learned to crochet long before learning to knit. But I don't like it much. And I don't do it often. When you add my dislike for the art and the infrequency with which I do it to the fact that the pattern was written by a fibre artist, not a pattern writer, I struggled. I texted Wilma with my issues. 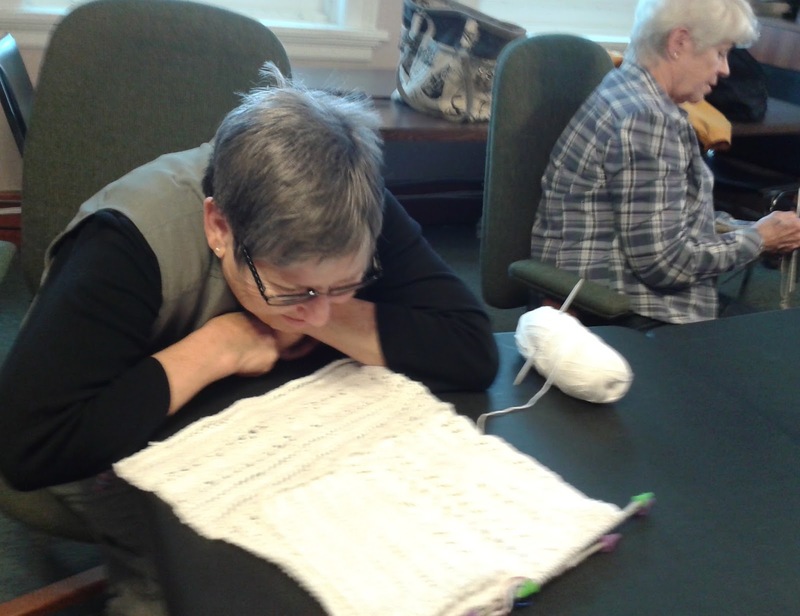 She remembered struggling with the pattern herself while out west. And another friend who had received a copy had also talked to Wilma about not 'getting it.' Wilma suggested I bring yarn and hook to knit group last week and we could work on it together. And that is what I did. It was just a matter of pattern intrepretation. The pattern writer had an (to me at least) uncommon way of expressing instructions. Once I understood the difference between what she said and what I thought she was saying, I was underway. But I'd have to say I didn't enjoy it. I had forgotten how much heavier crochet is than knitting And how much more yarn it takes. Most importantly for me though, is that I cannot crochet unless I am looking at my work. I cannot look up at the TV or talk to a friend. Takes the fun out of handiwork for me. 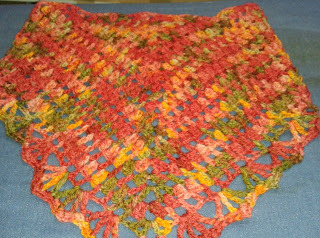 But I persevered and finished the kerchief. That is, finished minus the last few rows of instructions. I was tired of it. Instead of the few rows of lacey edging called for in the pattern, I did one row and called it done! Enough! 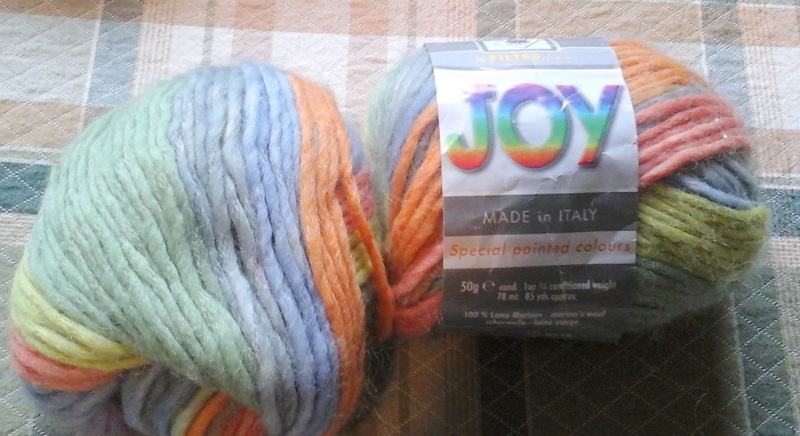 The yarn has been in my stash for years. More than ten years I know. And I don't remember anything about it - gauge, manufacturer, fibre content. All I remember is that a friend had made a gorgeous shawl with the yarn and when she mentioned that she had two skeins left over I bought them from her. 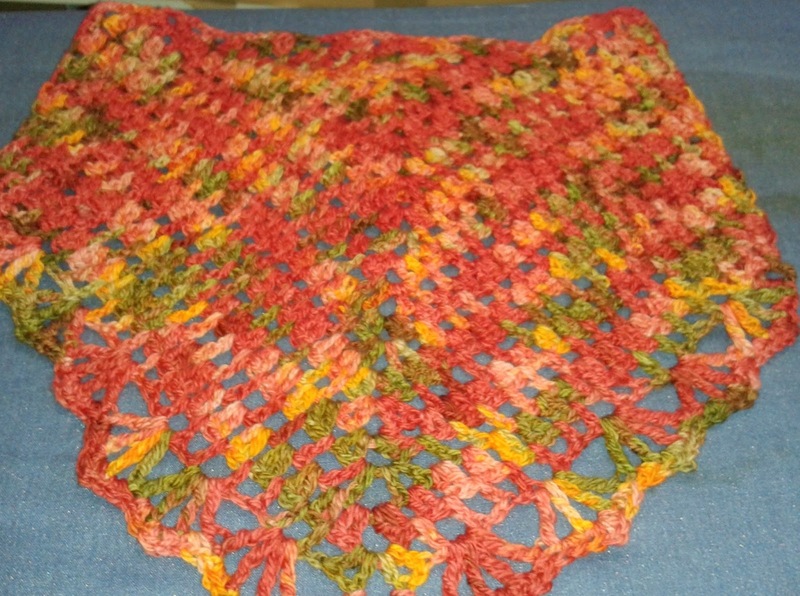 The advantage of the kerchief style is that there is far less bulk at the back neck than offered by a cowl. 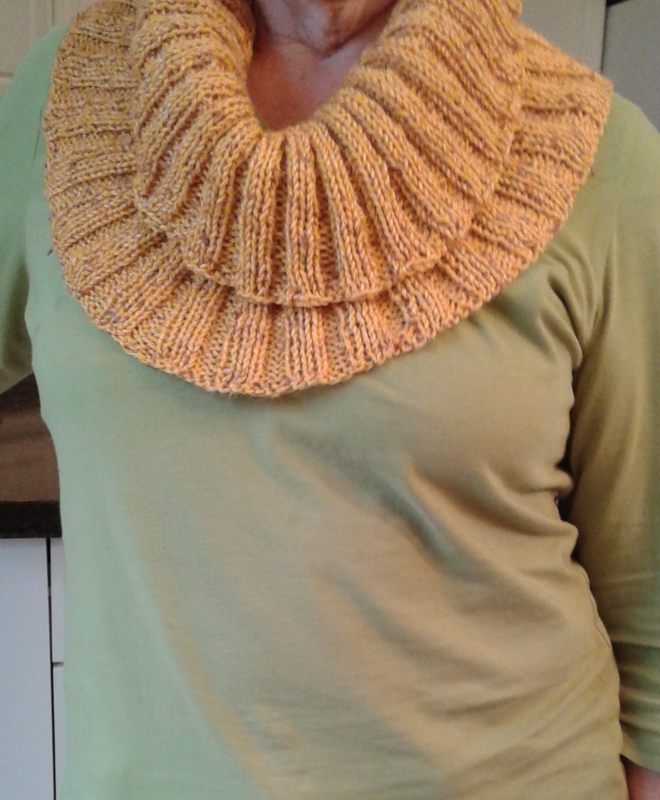 The disadvantage of the kerchief style is that there is far less bulk at the back neck than offered by a cowl. Bulk that might keep winter winds at bay. However for style and indoor wear, less bulk works. Nonetheless, I won't be crocheting another one soon.